The builders were not working on a clean site; they would have had to clear back the rubble and surviving parts of the old church as they built the new. 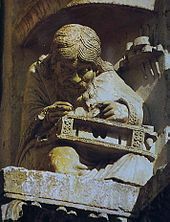 Work nevertheless progressed rapidly: the south porch with most of its sculpture was installed by 1210, and by 1215 the north porch and the west rose window were completed. The nave high vaults were erected in the 1220s, the canons moved into their new stalls in 1221 under a temporary roof at the level of the clerestory, and the transept roses were erected over the next two decades. The high vaults over the choir were not built until the last years of the 1250s, as was rediscovered in the first decade of the 21st century. In 1836, the old lead-covered roof, with its complex structure of timber supports (known as 'the forest') was destroyed by fire. It was replaced with a copper-clad roof supported by a network of cast iron ribs, known as the charpente de fer ('iron frame'). At the time, the framework over the crossing had the largest span of any iron-framed construction in Europe. 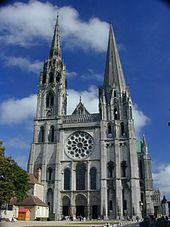 The Cathedral of Chartres was therefore neither destroyed nor looted during the French Revolution and the numerous restorations have not diminished its reputation as a triumph of Gothic art. The cathedral has been spared the damage suffered by so many during the Wars of Religion, the Revolution, and two world wars. All the glass from the cathedral was removed in 1939 just before the Germans invaded France, and it was cleaned after the War and releaded before replacing. In 1944, when the German-occupied city was invested by American troops, Colonel Welborn Barton Griffith, Jr. entered the city to determine the location of German forces. He noticed that fire was being directed at the cathedral, entered it, determined that no German forces were there, and signalled to cease fire. A short time later he was killed in action. ^ "John James | International Center of Medieval ArtInternational Center of Medieval Art". Medievalart.org. Retrieved 12 March 2013. ^ MilitaryTimes.com. "MilitaryTimes Hall of Valor". Welborn Barton Griffith, Jr. Military Times, a Gannett Company. Archived from the original on 18 January 2012. Retrieved 10 May 2011. This page was last edited on 20 April 2019, at 00:08 (UTC).